3D Unicorn stands out from base. Lovely addition to child's room decor. 3D lamb stands out from base. Lovely addition to child's room decor. 3D lion stands out from base. Lovely addition to child's room decor. Square wooden plaque on easel (not wall hanging). BT (Northern Ireland) IM (Isle of Man) & Channel Isles. Light blue background with paw prints. A great gift for dog lovers. Brown with brown and white terrier type dog. 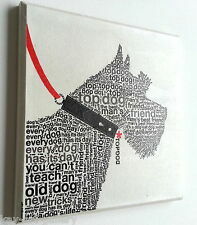 A great gift for dog lovers. This shabby chic set of 2 handmade plaques feature a fun farmyard motif and a high-quality enamel finish. With a bright and colourful piglet and chicken design, this duo can be displayed together or individually throughout the home as a unique decorative accessory which can be easily mounted to the wall. YH Art's wonderful range of hand-crafted tubelined porcelain plaques are made with high-fired glazes in a stunning range of colours. 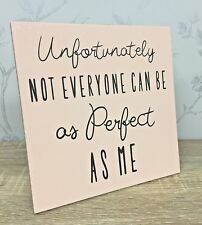 This pretty plaque is 6" (152mm) square and made to be used in a variety of ways - having a heat-resistant MDF backing it will make a fine trivet or teapot stand, there is also a folding stand so it can be displayed upright and a round hole where a hook or screw-head would fit to allow wall hanging. These are a unique design only found by the artists from AllChic. YH Art's wonderful range of hand-crafted tubelined porcelain plaques are made with high-fired glazes in a stunning range of colours. It is simple to remove the backing if you want to incorporate them in a tile design by just soaking it in warm water. Folks listed are these primitive-style rooster plaques pictures with nice wire top hangers. They have been scuffed when originally made to give them an older look. See all photos. Natural Life LLAMA Box Sign LLIVE HAPPY New Gold Leaf Edge Tabletop. This adorable llama reminds us to LLIVE Happy featuring a distressed gold leaf edge and heart. New with tag on back. Very light and measured 7” by 7”. 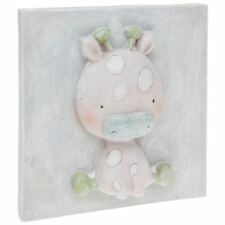 Great for a baby’s room or your desk. Will make you smile. And I am donating 10% of the selling price to the North Shore Animal League. Shipped with USPS First Class Package. Pet Memorial Framed Ceramic Photo Plaque. Personalised. Your Photo & Script. Instructions for Personalised Products. Good communications is essential for this personalised service we provide. (Ceramic Tile Size: 6"x8"). 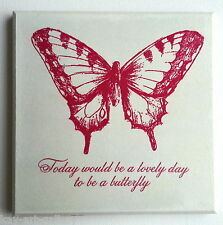 Why Use Our Printed Ceramic Tiles For Photo Plaques?. What Are The Benefits?. A Cowboy Lives Here with the Ride of His Life Small Box Sign ~ Wood and paint construction ~ can be hung or will stand on the tabletop. We want to ensure your experience buying from us is great ! Condition: New from the manufacturer. 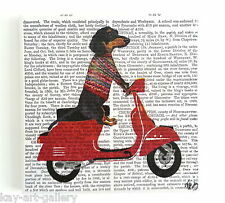 Suitable for wall decoration in kitchen/bathroom or can use as a decorative coaster. ALSO GREAT AS A COASTER (Place cork, rubber or felt stoppers underneath). ENGLISH BULLDOG. FEATURE TILE FOR BATHROOMS. Decorative Plank Style Style Wood (MDF) Plaque Sign. The Stark Red Lettering Reading Bear Creek Lodge Gets Guests in the Mood for a Cabin Retreat. ~ Bear Creek Lodge Decorative Wooden Sign ~. Plaque is Painted with a Rich-looking yet Distressed Style that Really Attracts the Eye. Wood Block Sign Stained Young Owl Distressed Print Home Decor Handmade 7"
Wooden Block Was Cut, Lightly Sanded, and Stained, Then Decorated w/ A Graphic Print. Adhered And Sealed Using The Decoupage Technique. Felt Pads Added To The Bottom To Protect From Scratching. Wooden Block Surface Shows Natural Imperfections Like Knots, Cracks, Raised Areas, Dents, Dings, Etc. Suitable for wall decoration in kitchen/bathroom or can use as a decorative coaster. ALSO GREAT AS A COASTER (Place cork, rubber or felt stoppers underneath). FEATURE TILE FOR BATHROOMS. WALL TILE/COASTER. Graphic Print Was Then Adhered And Sealed Using The Decoupage Technique. Felt Pads Were Added To The Bottom To Protect From Scratching. Wooden Block Surface Shows Natural Imperfections Like Knots, Cracks, Dents, And Dings. Handmade Wood Sign "I Am Fearfully & Wonderfully Made". Rustic Shabby Plaque-New. BE SURE TO CHECK OUT NEW TREASURES HERE &. Our goal is for you to be happy with your. Home Decor Ceramic Tile Sign w/ Easel Boho Bull Head Rack Floral Feathers 7.5"
Bull Head with Feathers and Flowers On A Light Burlap Background Print. Ceramic Tile Is Decorated w/ A Designed Graphic Print Adhered And Sealed Using The Decoupage Technique. Or Great Gift Idea! To Clean : Dust with dry cloth. Home Decor Ceramic Tile Sign w/ Easel Boho Horse Head Floral Feathers Print 7.5"
Horse Head w/ Boho Floral and Feathers On A Light Burlap Background Print. Ceramic Tile Is Decorated w/ A Designed Graphic Print Adhered And Sealed Using The Decoupage Technique. Or Great Gift Idea! Silver scroll design right top corner and left lower corner - Left corner top there is a bow made of twine and crochet material. BORDER: pink. Wise words have never looked so pretty! This iron wall art features two beautiful butterflies with cutout wings on a floral background, and the phrase reads Live for Today, Dream of Tomorrow. Item weight: 1.60lbs.